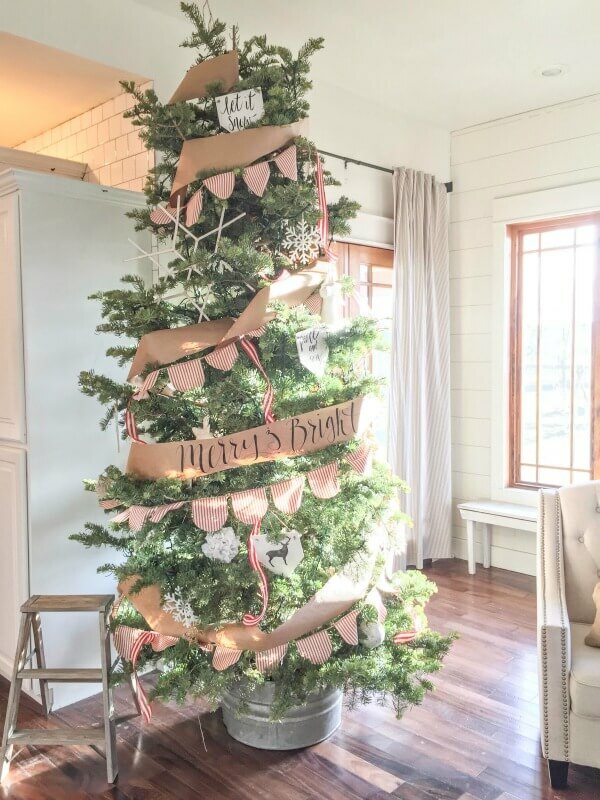 Have you seen all the amazing farmhouse Christmas trees around lately? I love this time of year to get ideas for our own Christmas tree at The Vanderveen House. It’s fun to change things up every year and add new decorations, and switch up the style and colors. When I think of farmhouse Christmas trees, I think of simple, natural, and personal handmade touches. 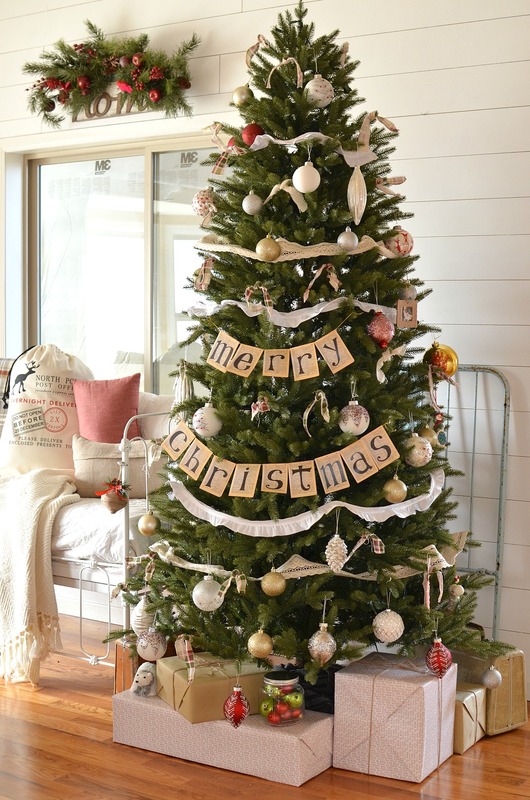 Use lots of natural elements, sparkly ornaments, and a variety of ribbon to create the perfect farmhouse Christmas tree. 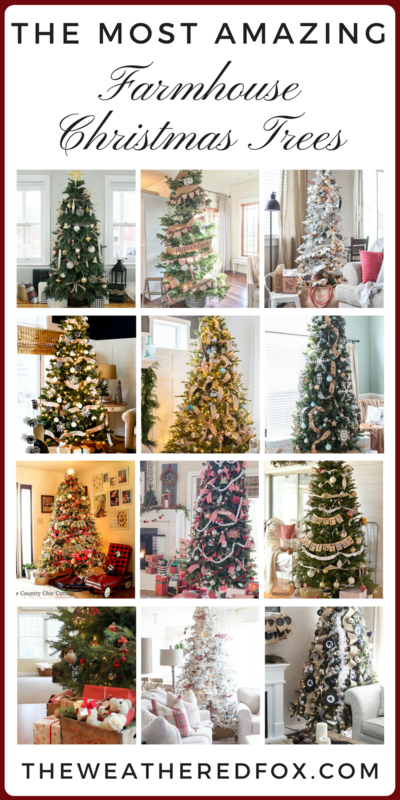 Here are some great examples of farmhouse Christmas trees that you can use as inspiration for your own tree. I love this vintage farmhouse tree from Little Vintage Nest. 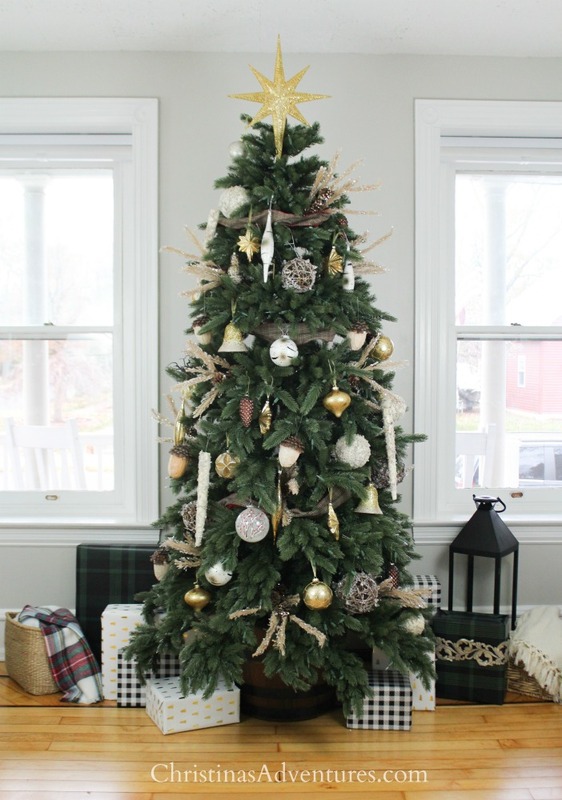 I love the simple design, and the lace trim really makes this tree unique. When you’re going through this roundup, please pin each image from the original source. 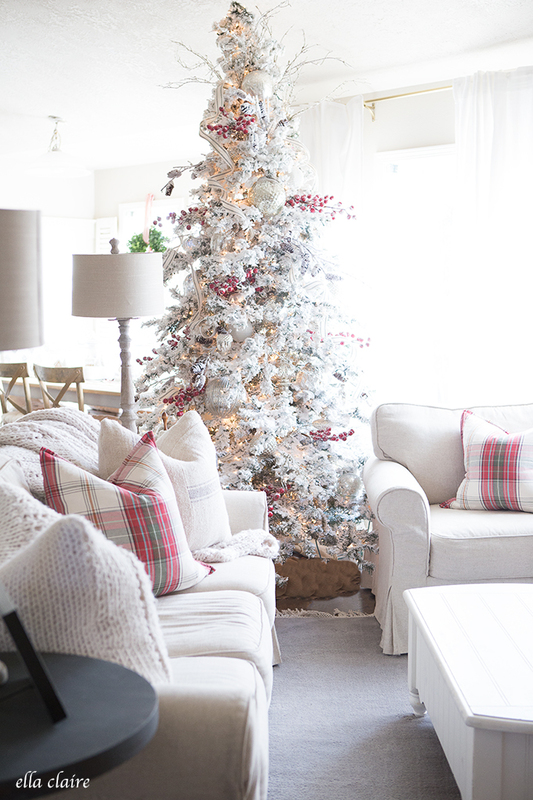 If you like a white Christmas tree, this one from Ella Claire Inspired is stunning. The red berries, sparkly ornaments, and neutral ribbons creates a perfect mix. I don’t usually love red, but at Christmas time it just seems natural to decorate with red. And red plaid is even better! 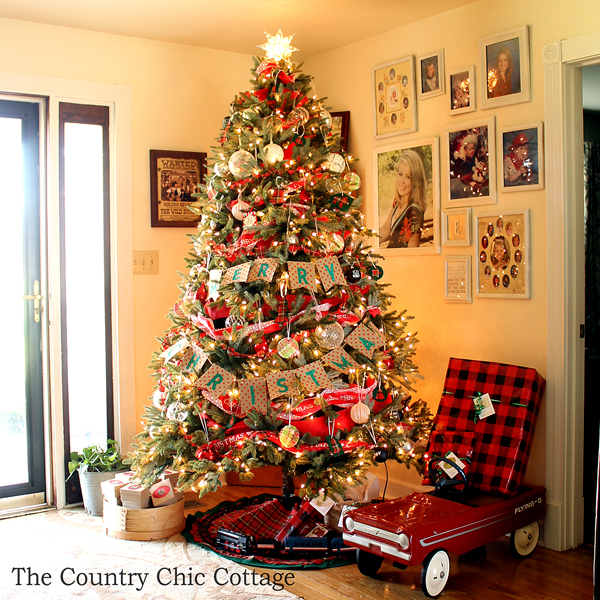 Here are some great ideas from The Country Chic Cottage for making your own plaid ornaments to create a red, silver and green tree. 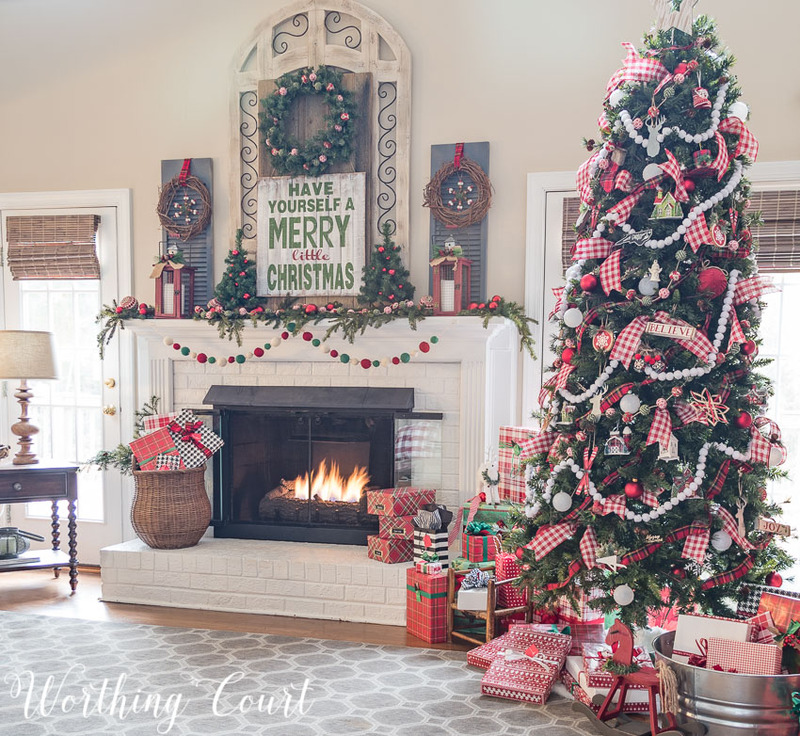 This living room from Worthing Court Blog is so cozy and perfectly decorated for Christmas. I love the white pom pom garland on the tree, I’ve put that on my list to add to our own tree next year. The pom poms keep the room looking down-to-earth, but also so very pretty. 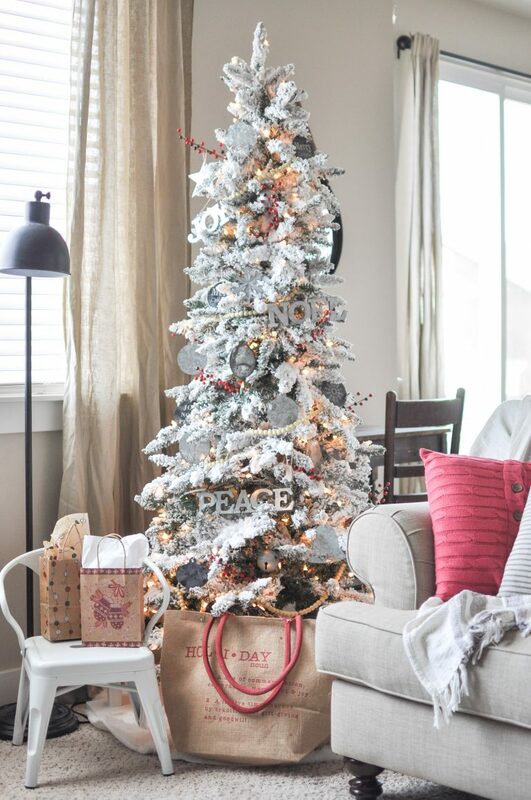 This tree from Twelve on Main has the most unique garland – butcher paper! There is a mix of all kinds of natural elements and greenery for a beautiful Farmhouse Christmas home tour. Life on Kaydeross Creek shows you around her beautiful farmhouse home. 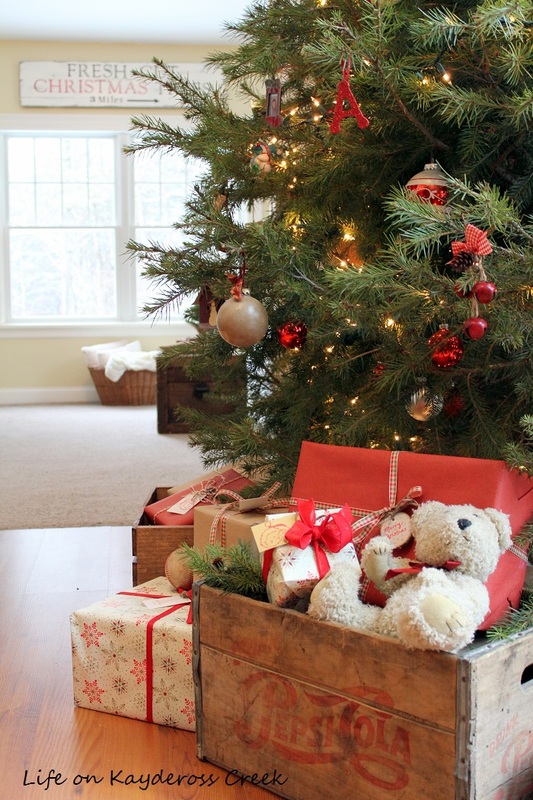 Her tree is decorated with red and green, but my favorite is the teddy bears in a crate under the tree. I have a few kids that would just love to see that! Ribbon looks so beautiful on a tree if it’s done right. 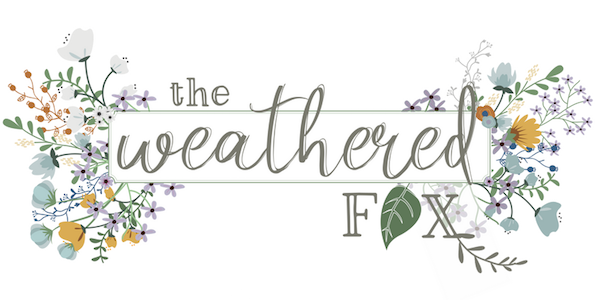 I have a hard time every year figure out how to make my ribbon look right, but The DIY Mommy has some great tips to make the ribbon look natural and full. 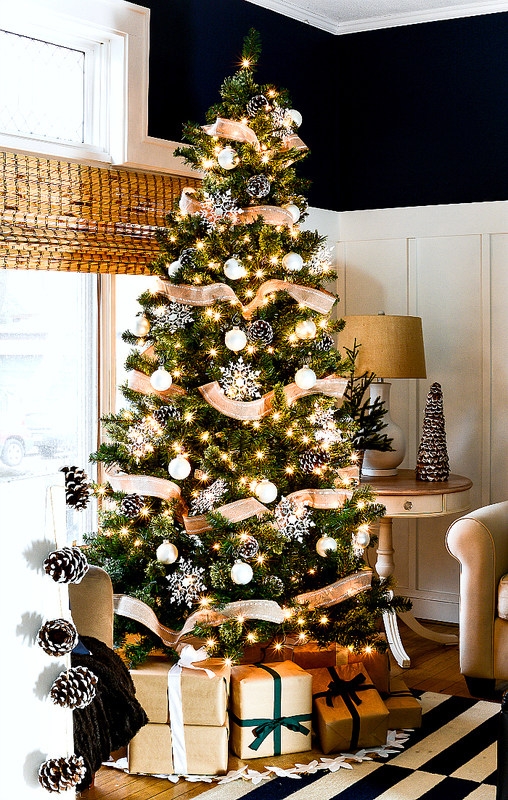 Use some chalkboard and galvanized metal ornaments to create a beautiful modern farmhouse Christmas tree. Natural elements can really create that farmhouse style. 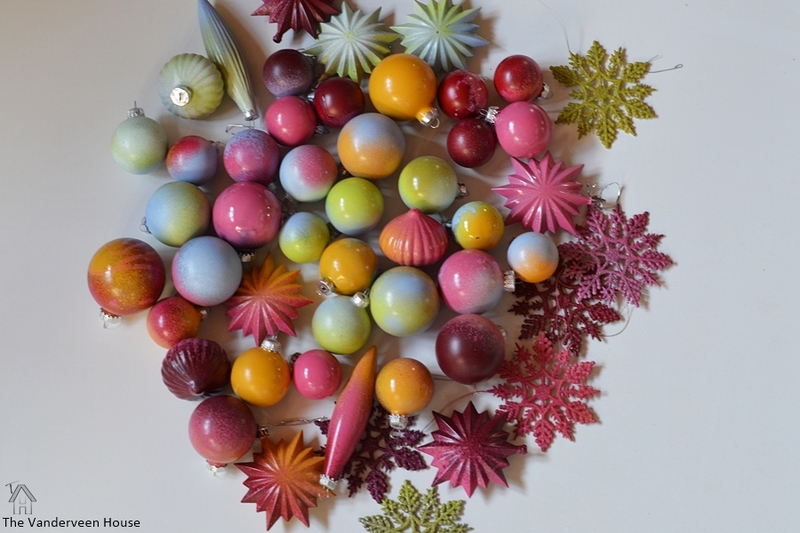 Get the look that It All Started With Paint created with some burlap ribbon and white tipped pine cones. I also love the simple brown paper wrapping paper. I’m always drawn towards blue and turquoise, and if you can add buffalo check that’s even better! 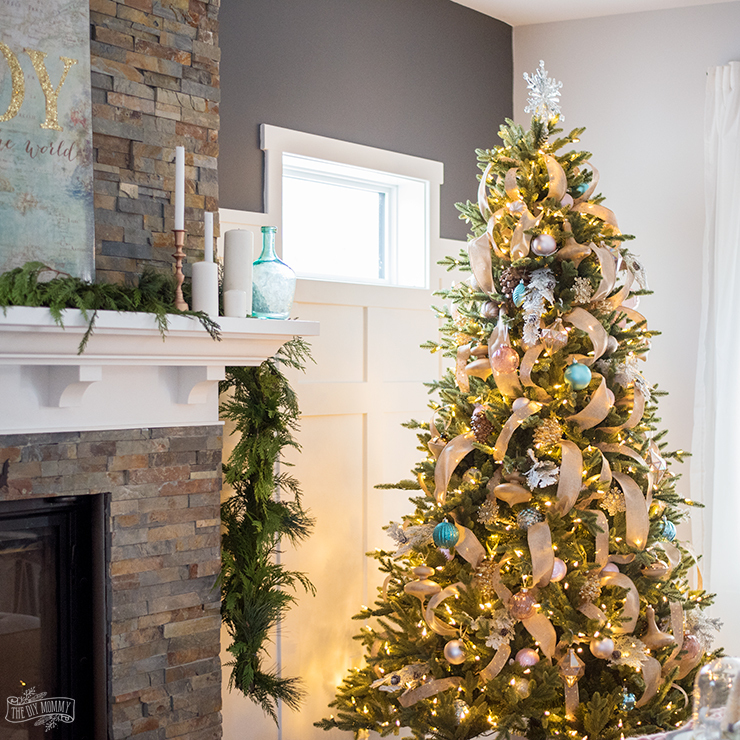 The Turquoise Home nailed this simple and classy tree by using blues, whites, and browns. AKA Design created beautiful contrast using burlap ribbon and feather boas, and chalkboard and gold ornaments. 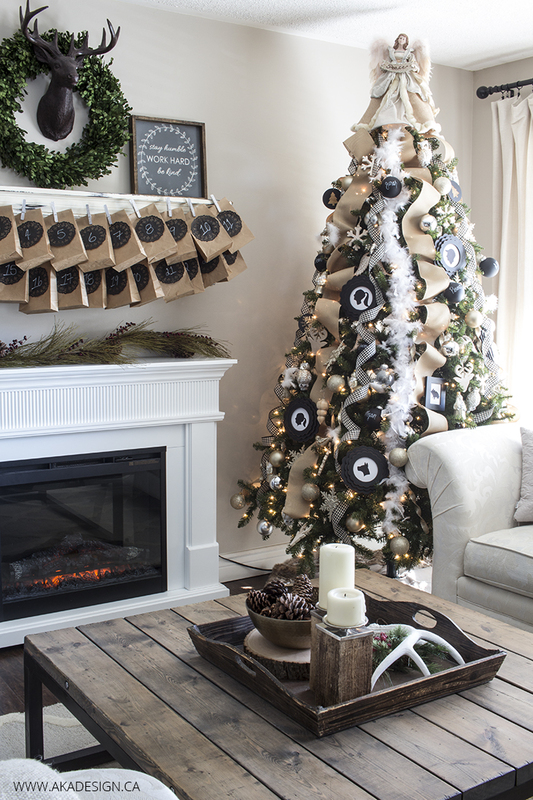 Christina’s Adventures uses a wine barrel tree stand for their rustic glam Christmas tree. 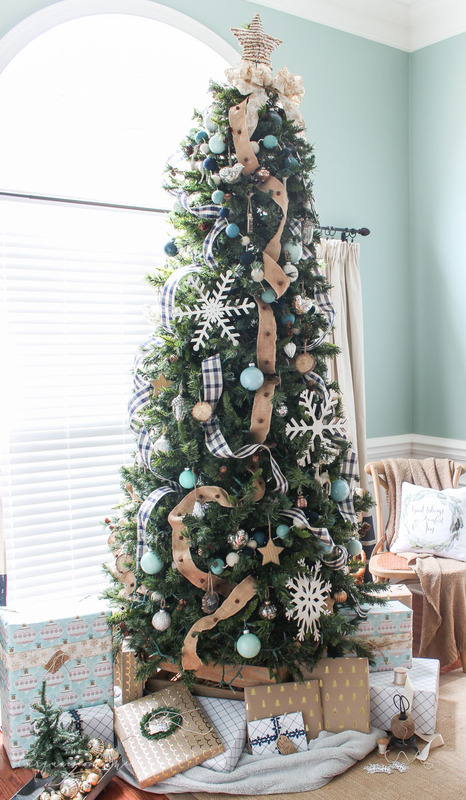 It looks amazing and really brings a farmhouse feel to the tree. 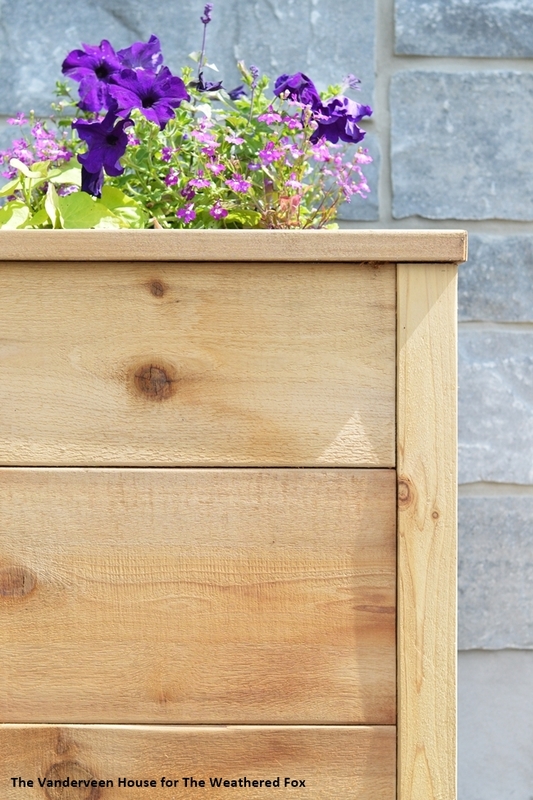 To see more projects from Jessica Vanderveen, have a look at these spray painted Christmas ornaments, dresser makeover, and DIY cedar planter.